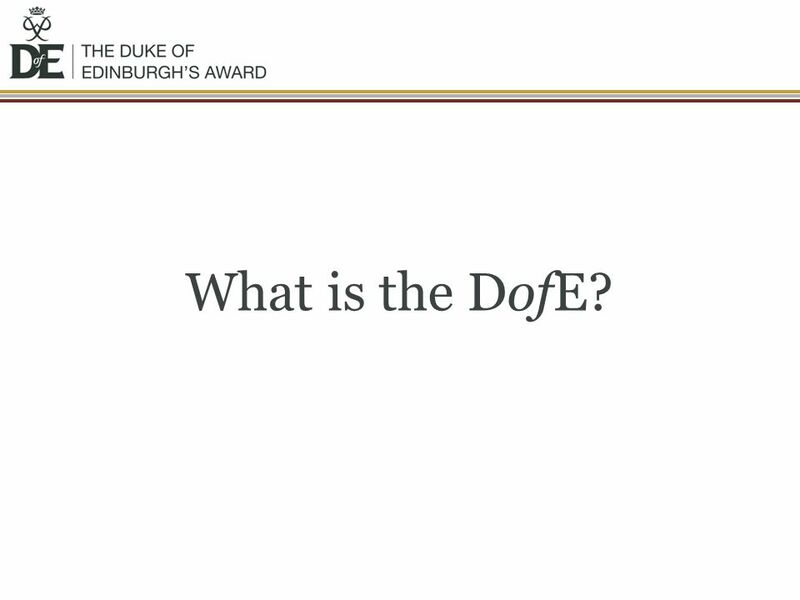 What is the DofE? This can be tailored to your specific audience if required. 1 What is the DofE? This can be tailored to your specific audience if required. 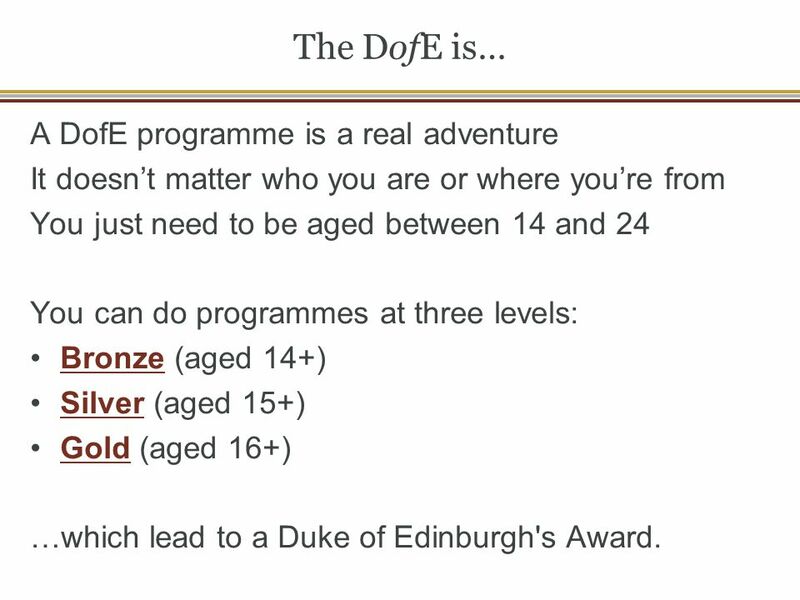 It doesn’t matter who you are or where you’re from You just need to be aged between 14 and 24 You can do programmes at three levels: Bronze (aged 14+) Silver (aged 15+) Gold (aged 16+) …which lead to a Duke of Edinburgh's Award. 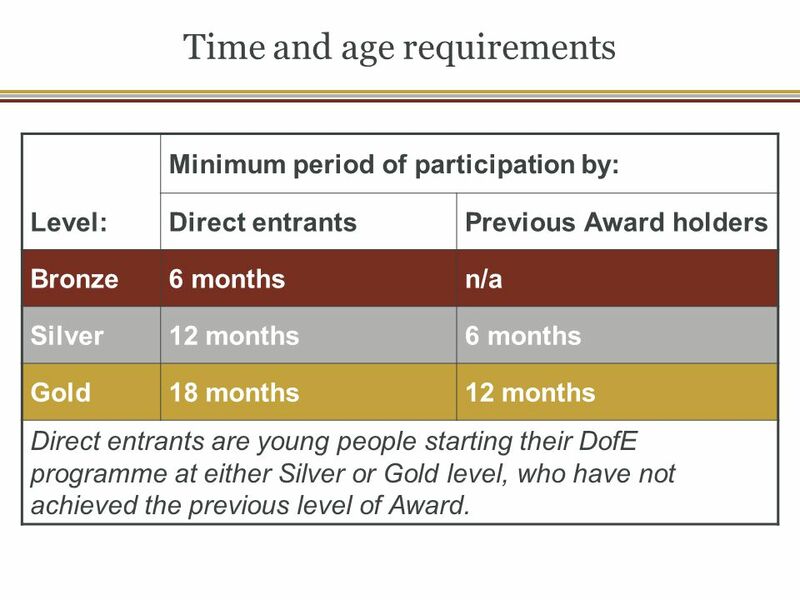 Minimum period of participation by: Level: Direct entrants Previous Award holders Bronze 6 months n/a Silver 12 months Gold 18 months Direct entrants are young people starting their DofE programme at either Silver or Gold level, who have not achieved the previous level of Award. 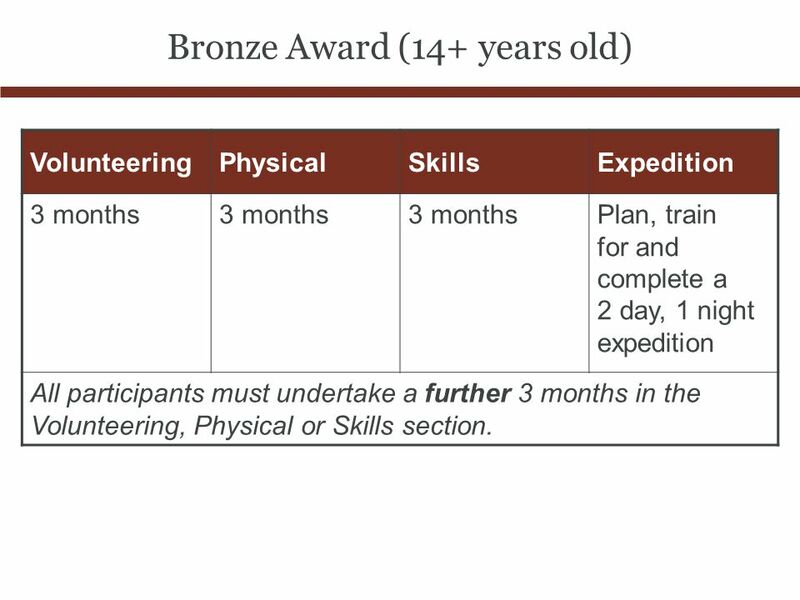 Volunteering Physical Skills Expedition 3 months Plan, train for and complete a 2 day, 1 night expedition All participants must undertake a further 3 months in the Volunteering, Physical or Skills section. 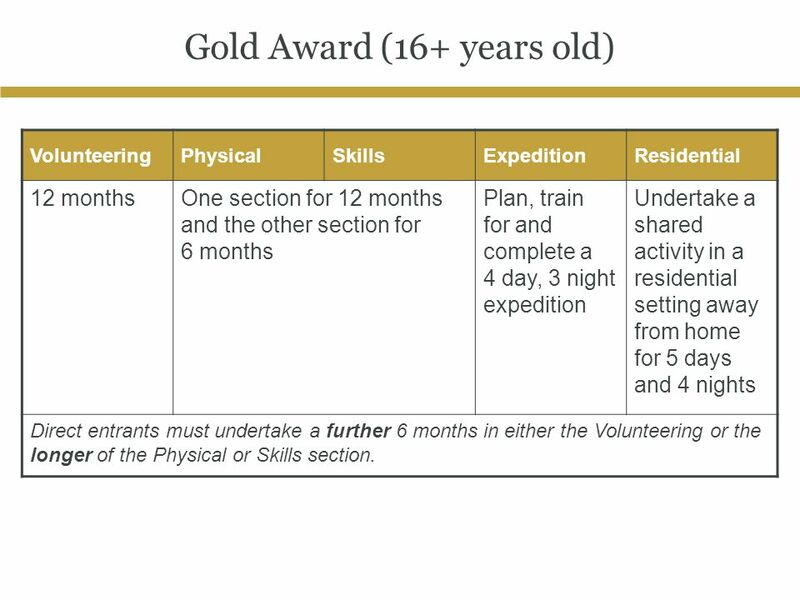 Volunteering Physical Skills Expedition 6 months One section for 6 months and the other section for 3 months Plan, train for and complete a 3 day, 2 night expedition Direct entrants must undertake a further 6 months in the Volunteering or the longer of the Physical or Skills sections. Volunteering Physical Skills Expedition Residential 12 months One section for 12 months and the other section for 6 months Plan, train for and complete a 4 day, 3 night expedition Undertake a shared activity in a residential setting away from home for 5 days and 4 nights Direct entrants must undertake a further 6 months in either the Volunteering or the longer of the Physical or Skills section. 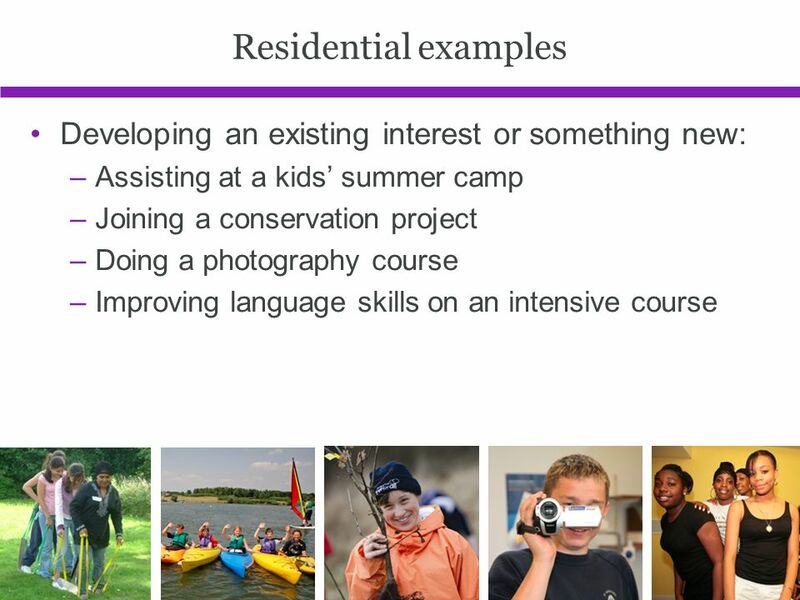 8 Choosing activities There is a massive choice of activities that count towards DofE programmes. 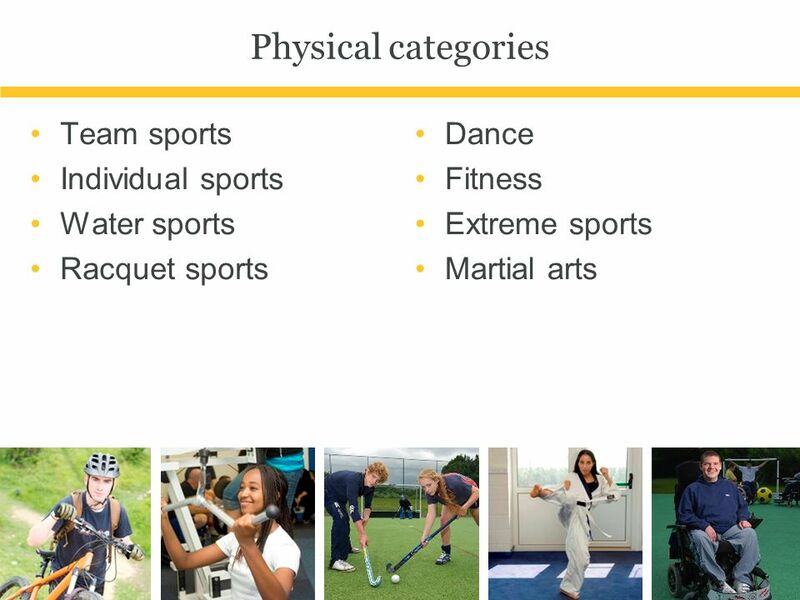 You can select practically any activity you want – as long as it’s legal and morally acceptable. 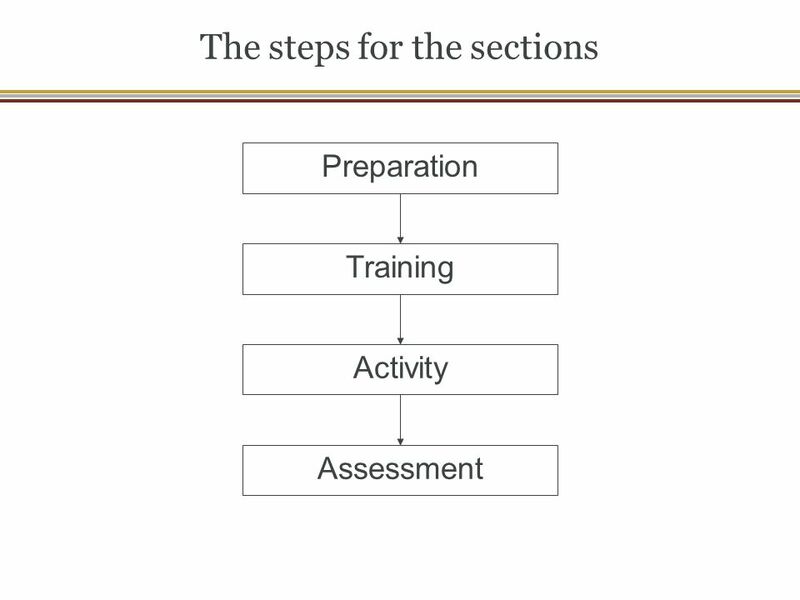 Activities are placed in specific sections for a reason. You need to choose activities you are going to enjoy. Activities could be something that you are already doing or perhaps one you’ve always wanted to try. You should achieve your Award before you start on the next level. 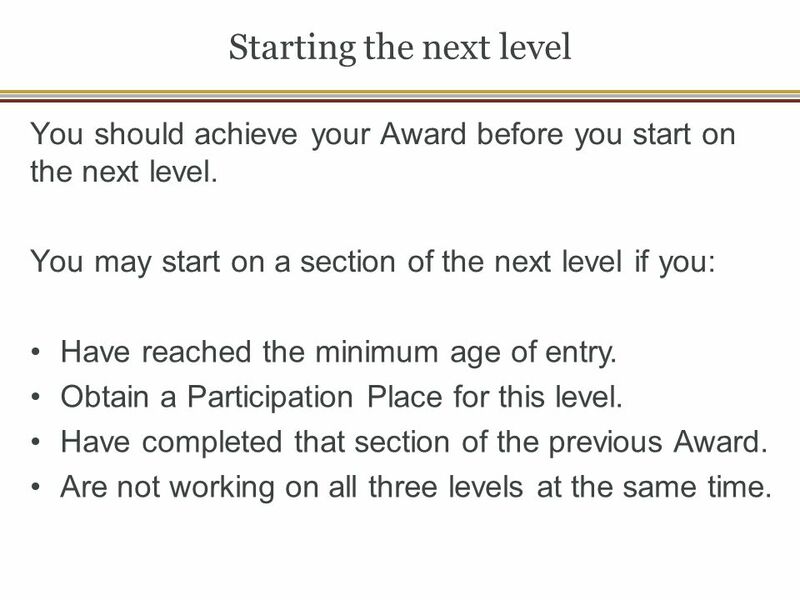 You may start on a section of the next level if you: Have reached the minimum age of entry. Obtain a Participation Place for this level. Have completed that section of the previous Award. Are not working on all three levels at the same time. 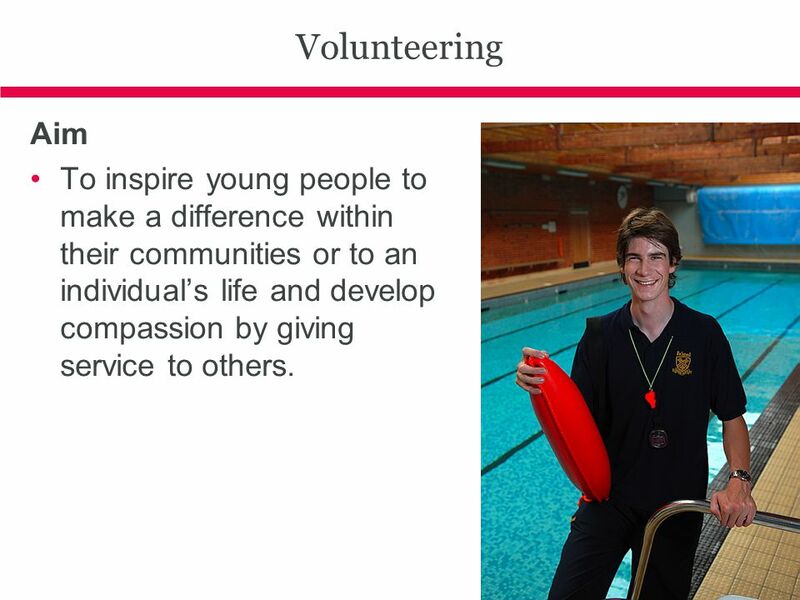 12 Volunteering Aim To inspire young people to make a difference within their communities or to an individual’s life and develop compassion by giving service to others. 13 Benefits Learn about their community and feel a sense of belonging and purpose. Learn to take responsibility for their communities and their own actions. Build new relationships. Further understand their own strengths and weaknesses. Develop teamwork and leaderships skills. Trust others and be trusted. Enjoy new adventures. 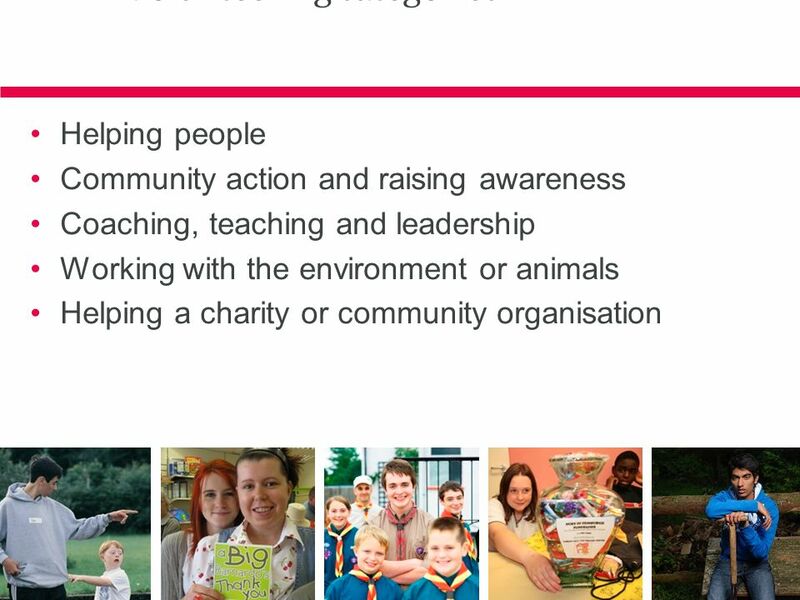 Helping people Community action and raising awareness Coaching, teaching and leadership Working with the environment or animals Helping a charity or community organisation Explain why we have chosen these activities – flexible enough that all volunteering activities should fit in. Old categories were very prescriptive. 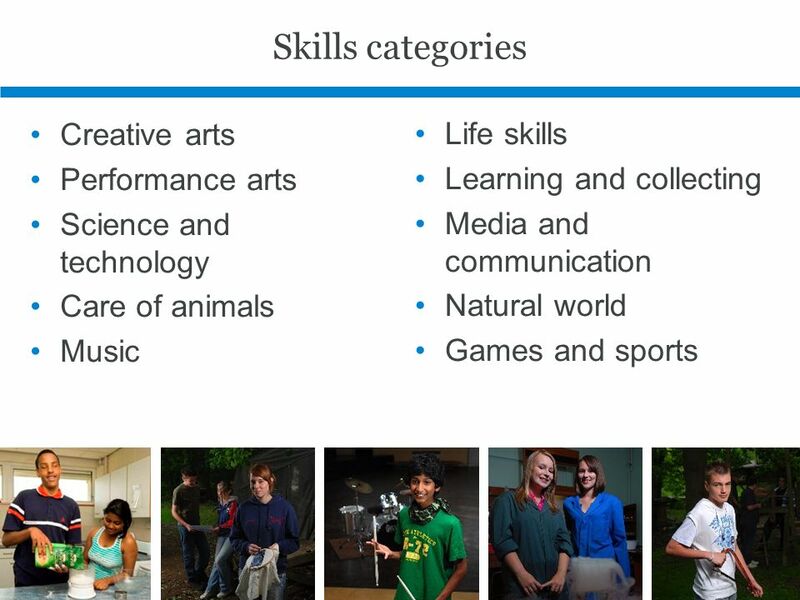 Make it clear that some activities will fit into more than one category, this doesn’t matter and will often depend on the aim of the young person. 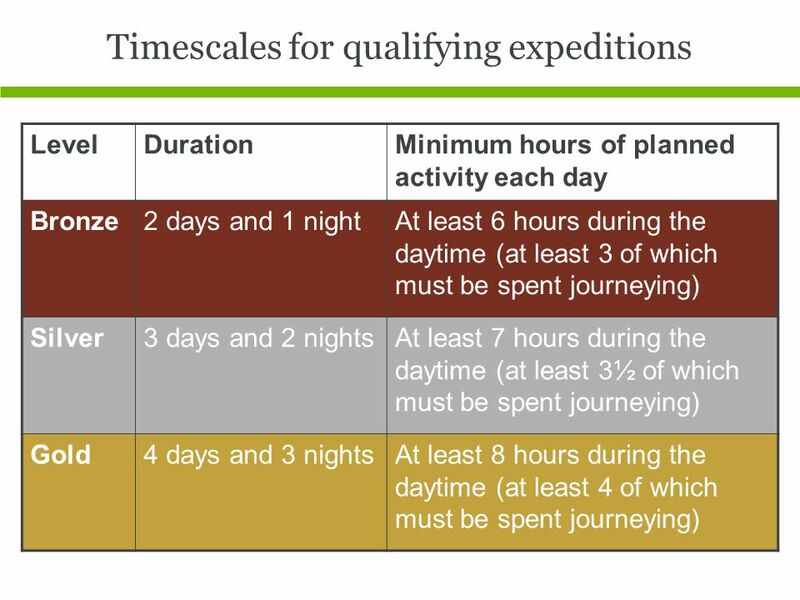 This is outlined on pages 41 – 42 on the DofE Handbook. 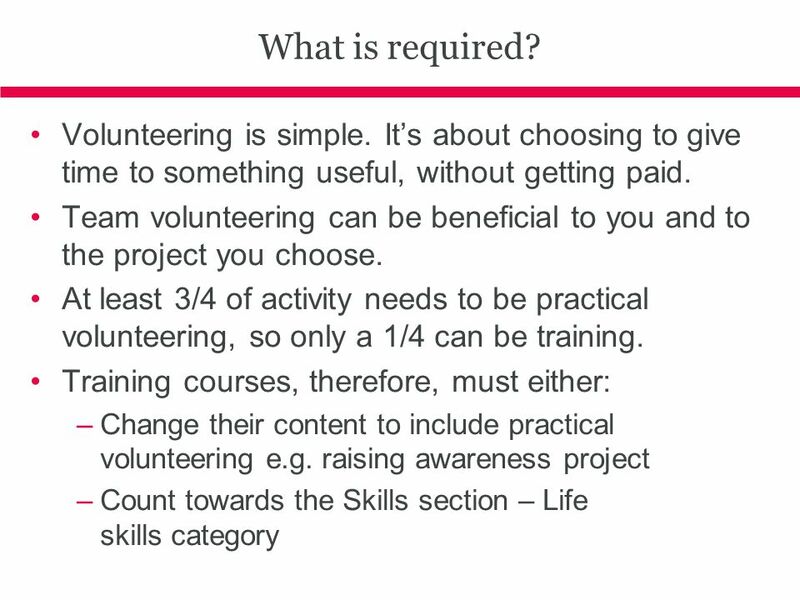 Give example on page 42 of Handbook about how First Aid training could be 3 months as a Bronze Skill for one person or training for 3 months and 9 months practical volunteering with St John Ambulance as a Gold Volunteering activity for another. You could use any example here: A Bronze DofE group attends a police course once a week to learn about the criminal justice system. As part of the course, the group are asked to design a project to raise awareness about personal safety in their community. A Gold DofE programme participant supervises the group and the police officer is the Assessor. The group deliver a number of assemblies to their peers as well as at the local primary school on how to stay safe. 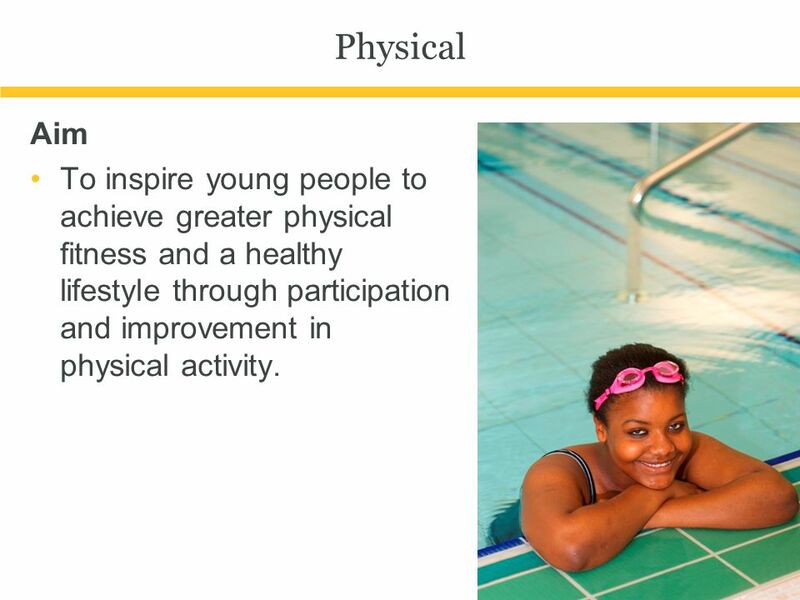 16 Physical Aim To inspire young people to achieve greater physical fitness and a healthy lifestyle through participation and improvement in physical activity. 17 Benefits Enjoy keeping fit. Improve fitness. Discover new abilities. Raise self-esteem. Extend personal goals. Set and respond to a challenge. Experience a sense of achievement. 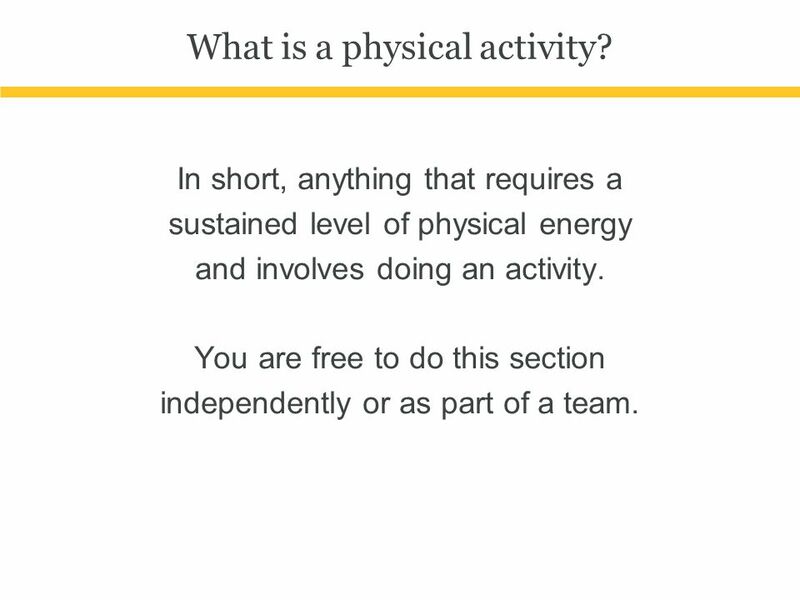 18 What is a physical activity? In short, anything that requires a sustained level of physical energy and involves doing an activity. You are free to do this section independently or as part of a team. 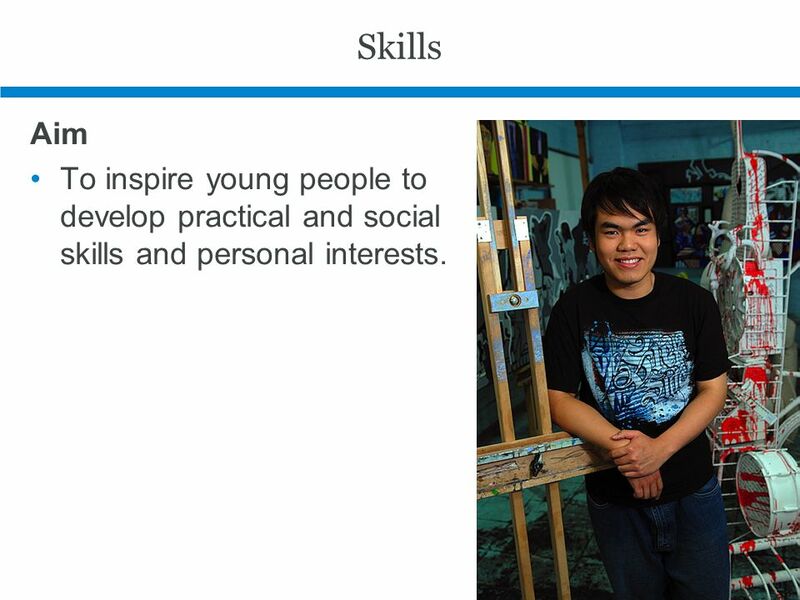 20 Skills Aim To inspire young people to develop practical and social skills and personal interests. 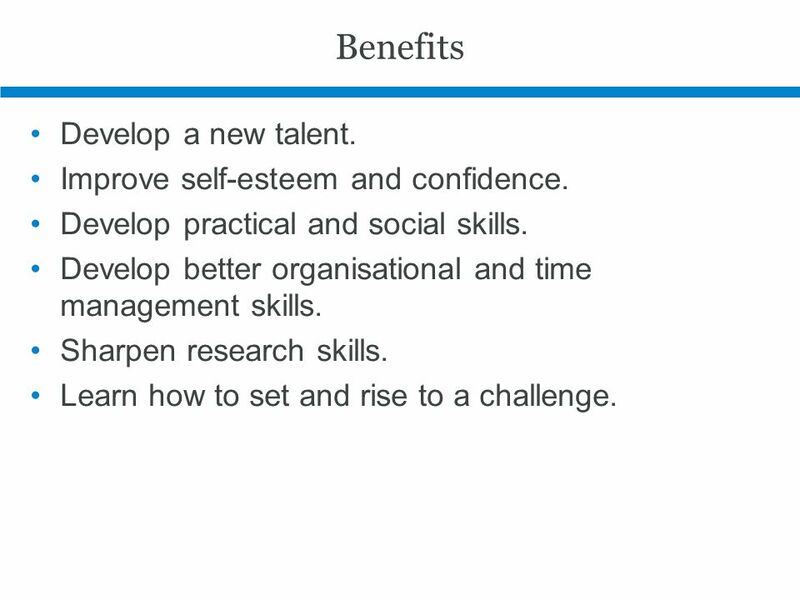 21 Benefits Develop a new talent. Improve self-esteem and confidence. Develop practical and social skills. Develop better organisational and time management skills. Sharpen research skills. Learn how to set and rise to a challenge. 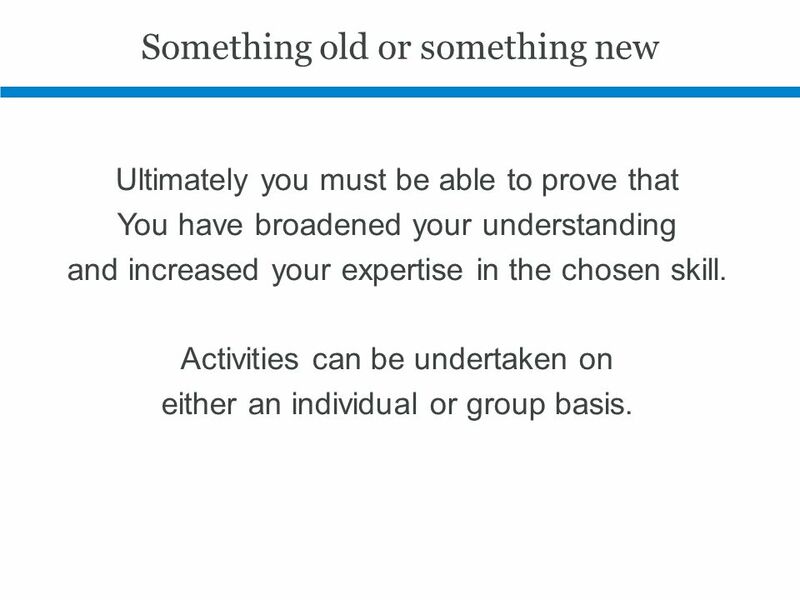 Ultimately you must be able to prove that You have broadened your understanding and increased your expertise in the chosen skill. Activities can be undertaken on either an individual or group basis. 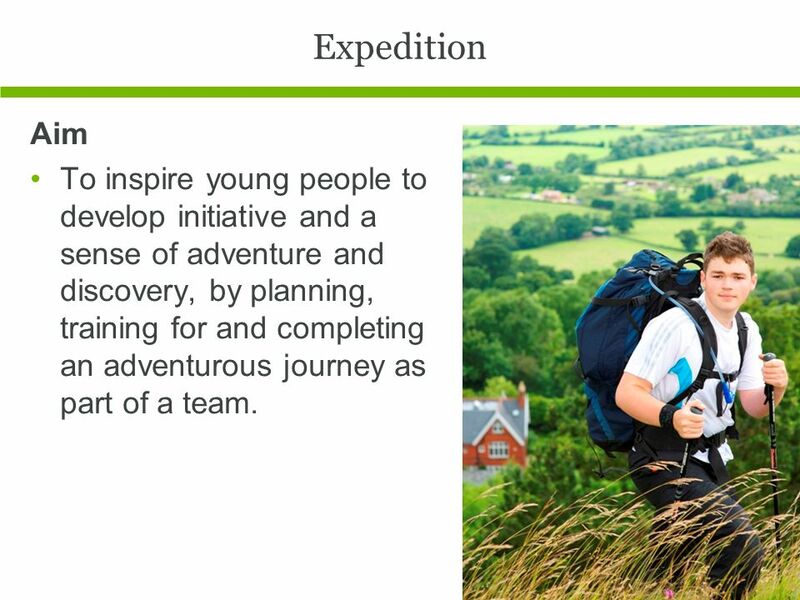 24 Expedition Aim To inspire young people to develop initiative and a sense of adventure and discovery, by planning, training for and completing an adventurous journey as part of a team. 25 Benefits Gain an appreciation of and respect for the outdoor environment. Learn the value of sharing responsibility for success. Learn the importance of attention to detail and organisational ability. Develop and demonstrate enterprise and imagination. Become more self-reliant. Become more able to overcome challenges. Recognise the needs and strengths of others. Improve decision-making skills and the ability to accept consequences. Gain skills to reflect on personal performance. Learn to manage risk. Learn through experience. 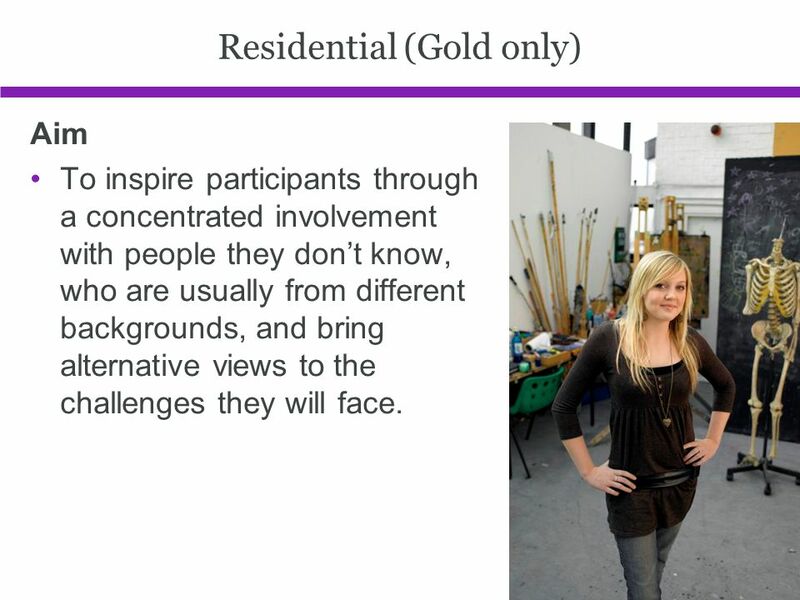 Aim To inspire participants through a concentrated involvement with people they don’t know, who are usually from different backgrounds, and bring alternative views to the challenges they will face. 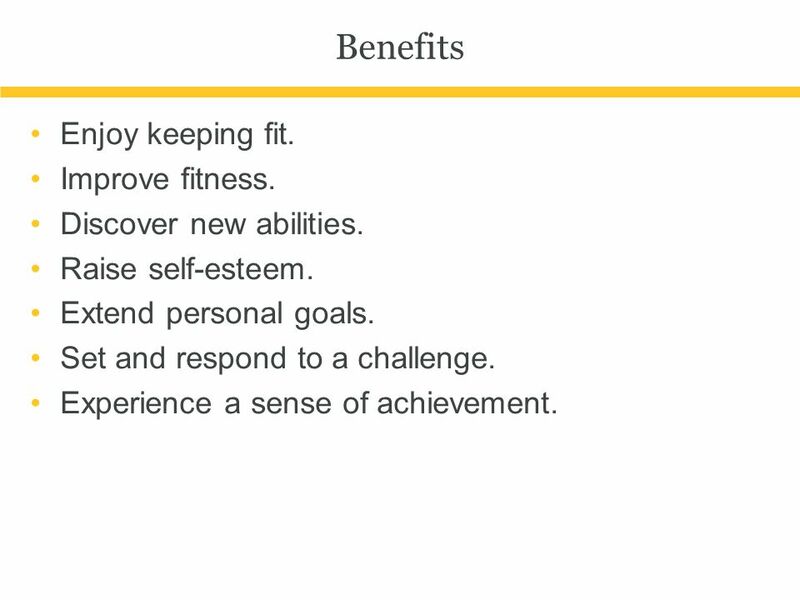 30 Benefits Meet people. Develop the confidence to thrive in an unfamiliar environment. Build new relationships and show concern for others. Work as part of a team towards shared goals. Accept responsibility for themselves and others. Develop communication skills and effective coping mechanisms. Develop respect and understanding for others. Show initiative. 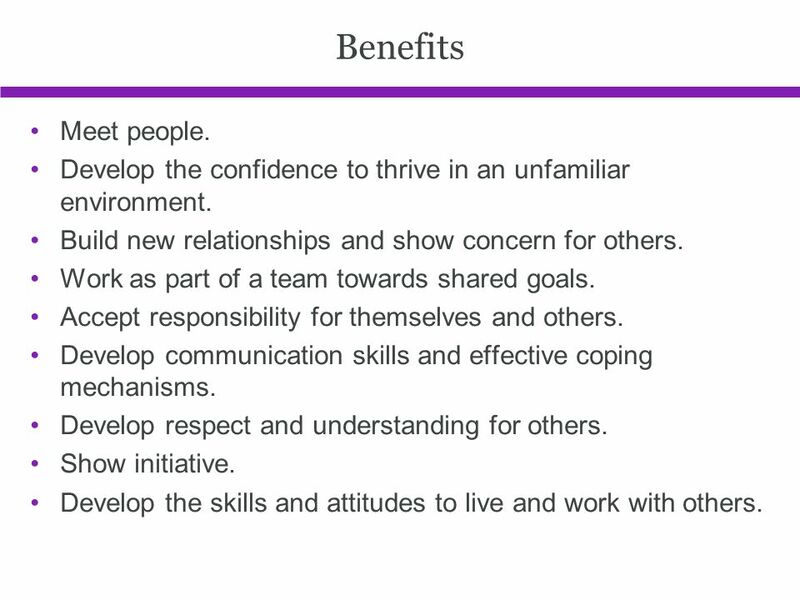 Develop the skills and attitudes to live and work with others. 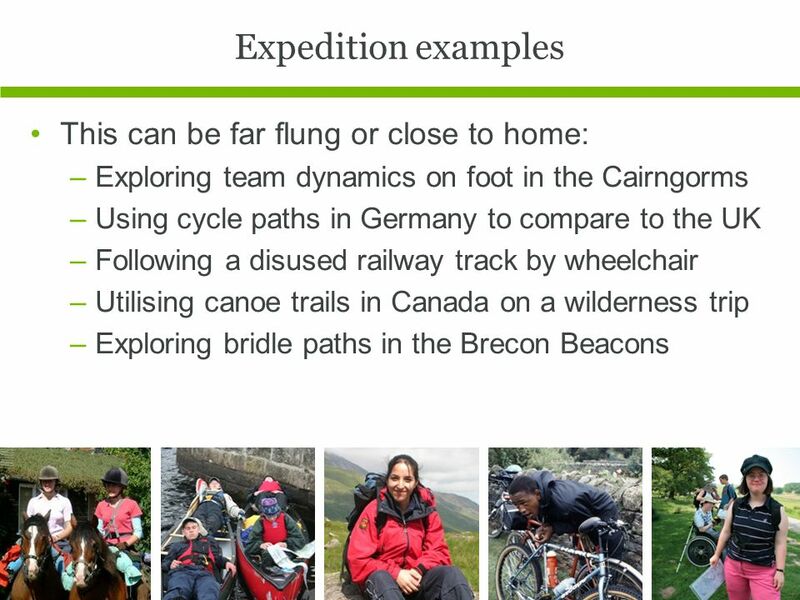 Download ppt "What is the DofE? This can be tailored to your specific audience if required." Duke of Edinburghs Award Information Seminar 610 (City of Chester) Squadron ATC. Parents Information Evening Gold section Music from hard drive (playlist in Media Player) and slideshow of Bronze and Silver Practice and Summer for the. 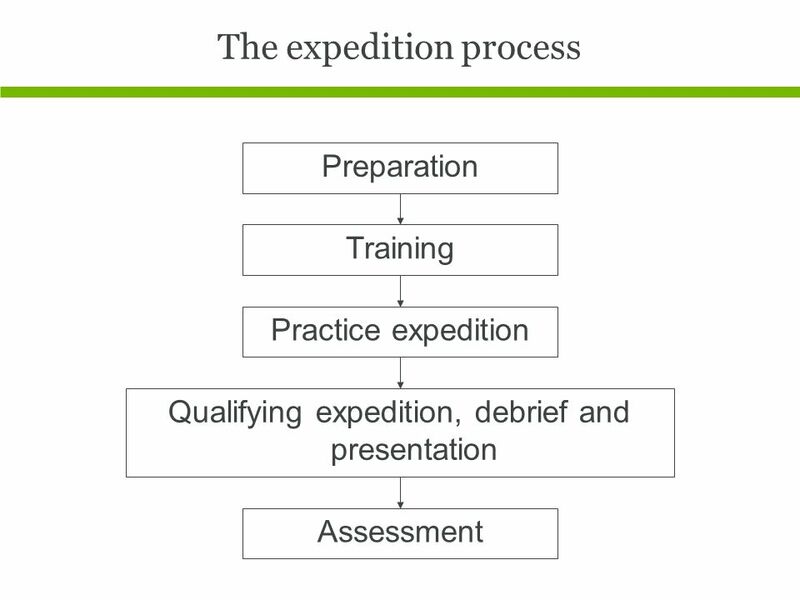 What is the DofE?. The DofE is… A DofE programme is a real adventure It doesnt matter who you are or where youre from You just need to be aged between. C reativity A ction S ervice. Q: When & how much ? The guideline for the minimum amount of CAS activity is approximately the equivalent of half a day. 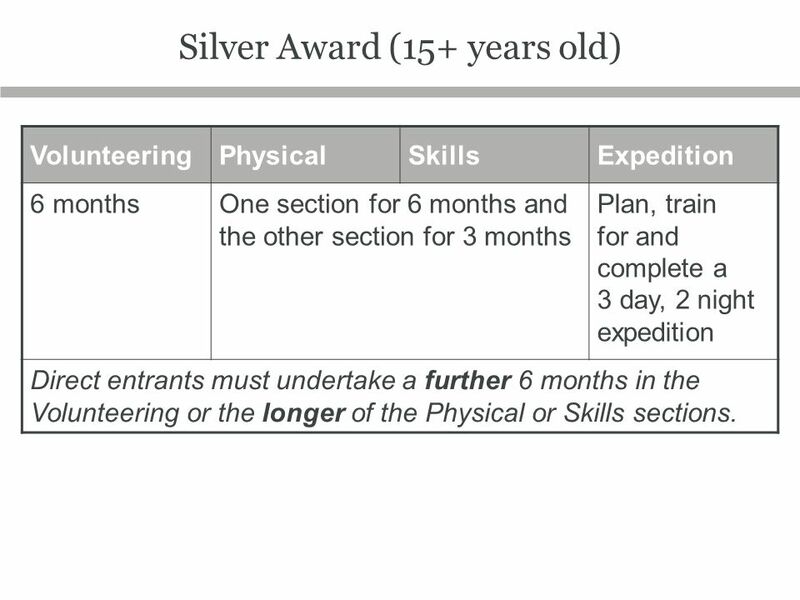 The Duke of Edinburgh’s Sections of the Award There are FOUR sections of the Award Scheme There are FOUR sections of the Award Scheme. An exciting leadership programme that will help you Step Up. 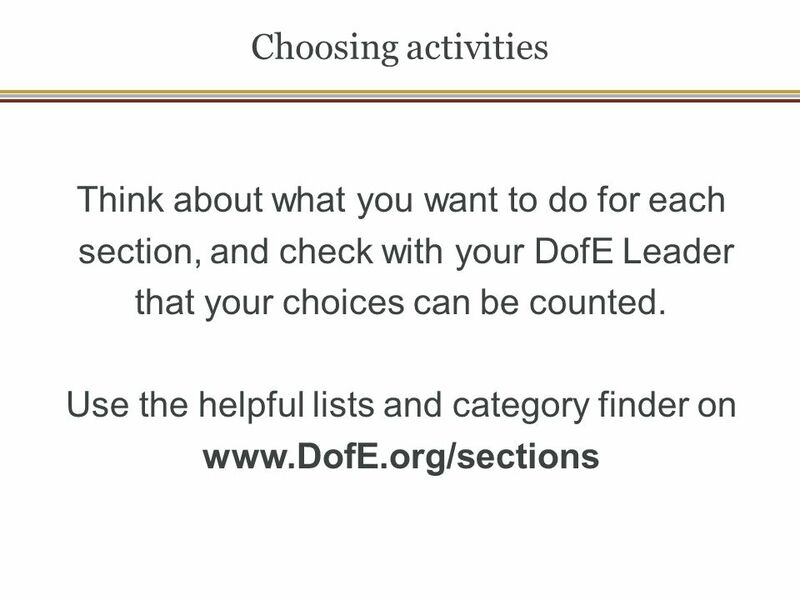 What is the DofE?. 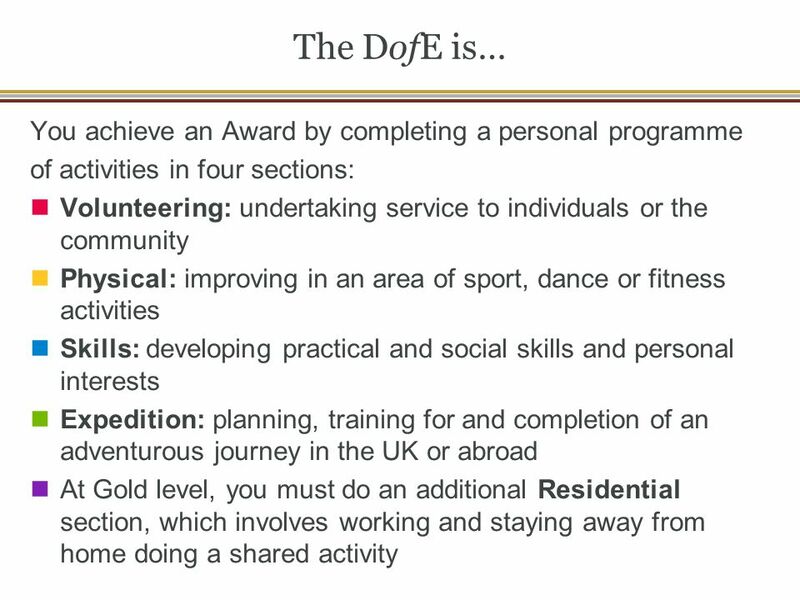 The DofE is… You achieve an Award by completing a personal programme of activities in four sections: Volunteering: undertaking service. T HE D UKE OF E DINBURGH ’ S A WARD What’s it all about? Why’s this man on the screen? Badges And Awards Membership Award Joining Explorers from outside Scouting Requirements:  Describe the various options available locally to become an. The Duke of Edinburgh’s Award aims to provide an enjoyable, challenging and rewarding programme of personal development for young people, which is of the. 1 The Duke of Edinburgh’s Award Young Canadians Challenge. 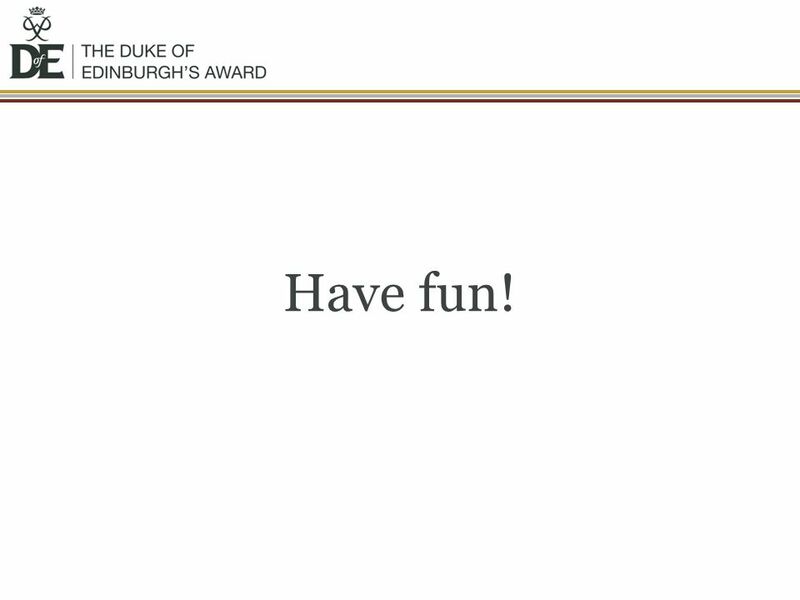 The Duke of Edinburgh’s Award Scheme Get Involved! Time Requirements Minimum period of participation by: Level:Direct entrantsPrevious Award holders Bronze6 monthsn/a Silver12 months6 months Gold18 months12. The Duke of Edinburgh’s Award THE INTERNATIONAL AWARD FOR YOUNG PEOPLE …now at ACU Community Engagement at ACU. Duke Of Edinburgh’s Award (Your) Company & The Award.  This is a leadership programme for young adults aged between 14 and 24, aiming at teaching them valuable skills, practices and experiences for life. D E of THE INTERNATIONAL AWARD FOR YOUNG PEOPLE THE DUKE OF EDINBURGH’S AWARD FOR YOUNG PEOPLE DAY WATERMAN COLLEGE.